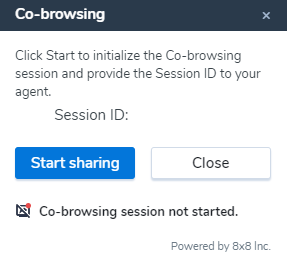 8x8 Co-browsing allows customer support agents to assist customers remotely via a shared browser. Either walk a customer through a task via phone or chat as you observe their screen or, if required, take control of their cursor and demonstrate how to perform the task as the customer observes. With Co-browsing, you can empower a website or any browser-based application, and offer live, hands-on assistance to customers in a way that most effectively answers their questions. A customer in need of assistance must initiate the remote session, generate a unique session code, and communicate it to an agent via phone or chat. The agent then uses the code to establish a remote session. The Co-browsing session takes place concurrently with a call or a chat for communicating the session code and assisting the customer. Sub-domain support: The Co-browsing session continues working if the user navigates to a site that is hosted in a sub-domain, assuming that Co-browsing is also available in that new sub-domain. Co-browsing only works in HTTPS secure web pages. WYSIWUG editors (such as AceEditor, CodeMirrorEditor, CKEditor, tinymceEditor) are not supported. If the web page opens a new browser window and the content has Co-browsing, this new window replaces the content on the agent side. Note: Co-browsing is not supported on IE 11 in compatibility mode. 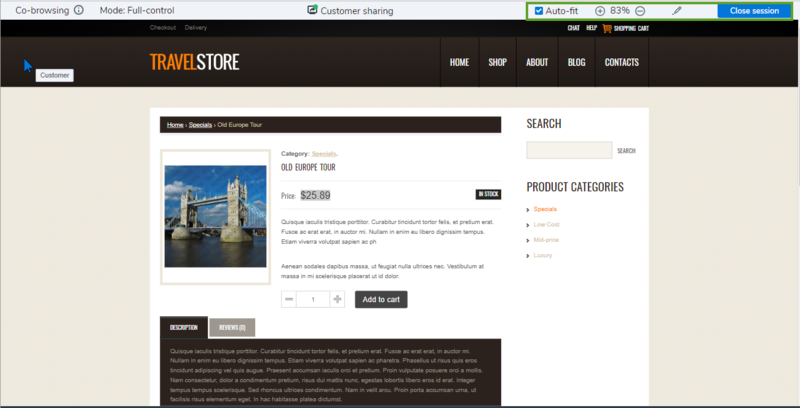 Let us review an example of a travel company website visited by customers wanting to book their dream vacations. The website offers many travel packages and options to choose from. It requires customers to identify themselves by filling in a form. The travel site wants to offer remote, hands-on assistance to the website visitors. 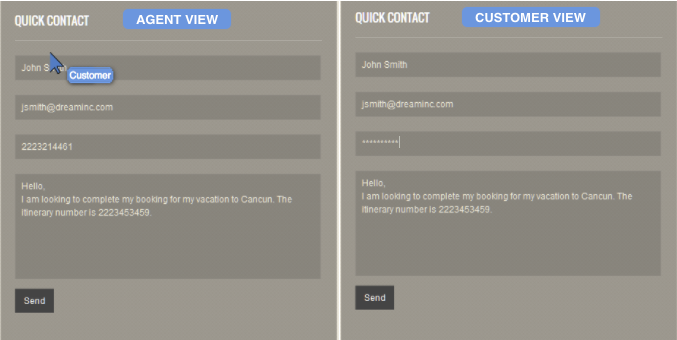 To enable live, hands-on assistance, the travel company should use 8x8. The Co-browsing feature allows website visitors to initiate a remote session with the customer support agent and get hands-on assistance remotely. If a customer navigating this website seeks hands-on assistance, they can initiate a remote session with a customer support agent in a few clicks. Click on a help link on the web page to generate a code. Communicate this code to the representative. The representative uses this code to establish a two-way hands-on Co-browsing session. full-control (default): This is the default mode. In this mode, agents have full control of the customer's browser session, including synchronized navigation and the ability to highlight and co-fill a form on the web page. The agent's cursor movements and mouse clicks are in sync with the customer, and vice versa. -The highlighter works in all modes. -In the full-control and partial-control modes, we cannot prevent agents from controlling form elements that are not native to the browser, such HTML drop-down. Co-browsing can be enabled to work as a link in the user interface of a website, or as an embedded chat window. Based on your company's needs, determine the number of simultaneous remote sessions you want to support on your website. This includes the number of sessions each agent can handle. Identify the domain address that will host the link for Co-browsing. For example, AcmeJets.com. Note: If you support Co-browsing in multiple domains, you must communicate the list of domains to your 8x8 sales representative. Work with your 8x8 sales representative to fulfill your order. Once the order is processed, your 8x8 representative provides the license ID and a code snippet. You must embed the code snippet received from your 8x8 sales representative in your website to allow customers to initiate a remote session. The code snippet must be added to all pages where you want to enable Co-browsing. Co-browsing sessions does not work on pages that do not have the snippet. Note: Depending on whether or not you need sub-domain support, the code snippet you use is different. If you know that the user will likely go to a site that is hosted in a sub-domain, you can use sub-domain support to enable the Co-browsing session to continue working, assuming that Co-browsing is also available in that new sub-domain. Do I need sub-domain support? This feature is new to version 1.9.0 of Co-browsing, and it requires an update to the Co-browsing code snippet to start working with sub-domains. If sub-domain support is not required, the old code snippet will still work as before, and there is no need to update. How did Co-browsing work prior to this feature? Prior to version 1.9.0, if the user started a Co-browsing session in a domain (such as www.somedomain.com) and navigated to another sub-domain (such as help.somedomain.com), the Co-browsing session would be disconnected. How does Co-browsing work now with this feature? Assuming that Co-browsing is properly configured, if the user starts a Co-browsing session in www.somedomain.com, and navigates to help.somedomain.com, the Co-browsing session will work as if the user is still navigating in the same domain. <co-browse-license-id>: Refers to your Co-browsing license ID; for example, 556c8b7beec7f02018b31700. <Customer-domain>: (Sub-domain only) Refers to the customer domain; populate the value so that Co-browsing can work in the required domain. <co-browse-mode>: (Optional) Refers to the Co-browsing mode. Select one of the three types: full-control, partial-control, or no-control. Add the code snippet within the <body> tags on the web page. Your completed code snippet should look like this. Please note that the value for <co-browse-license-id> is a variable. This step is optional, and is not required to complete the basic Co-browsing setup. You must complete this step only if you need to mask fields in a form. During a Co-browsing session, if the customer is filling a web form and entering sensitive information (such as their SSN), it can be hidden from the agent. To secure sensitive information during a Co-browsing session, 8x8 Co-browsing provides a default mechanism to mask previously configured elements. When customers enter data in the masked field, agents only see asterisks. Agents are not allowed to enter data in this field. To mask a field, you must add the “maskContent” CSS class to the element that should be marked by “*”. Note: Password fields are automatically masked. You do not need to add the “maskContent” CSS class to mask them. Save these changes to the web page. With this, you have enabled your web page with Co-browsing capability. Note: Check out our video on 8x8 Co-browsing. When you enable Co-browsing in an embedded chat window on a website, the Co-browse icon shows up on the chat window menu. Agents and customers can request and/or allow Co-browsing sessions via chat. Enable the Co-browsing check box to display the Co-browse icon in the chat window. This change is reflected in the preview of your chat window. Any customer in need of assistance can launch a Co-browsing session using a button or an embedded chat window on a website. If you are an agent, you can also initiate a Co-browsing session via chat. On a website, Co-browsing is initiated by customers seeking assistance. In this process, agents play a secondary role in establishing a remote session from Agent Console. Let's walk through this process on a travel website from the customer's perspective. While browsing through the website as a customer, initiate a call or chat with a customer support agent. On the web page, click the link used on the site to initiate Co-browsing (usually a Help link). A pop-up window appears, prompting you to start a remote session by generating a code. Note: If the buttons in the window are disabled, please contact your 8x8 sales representative. 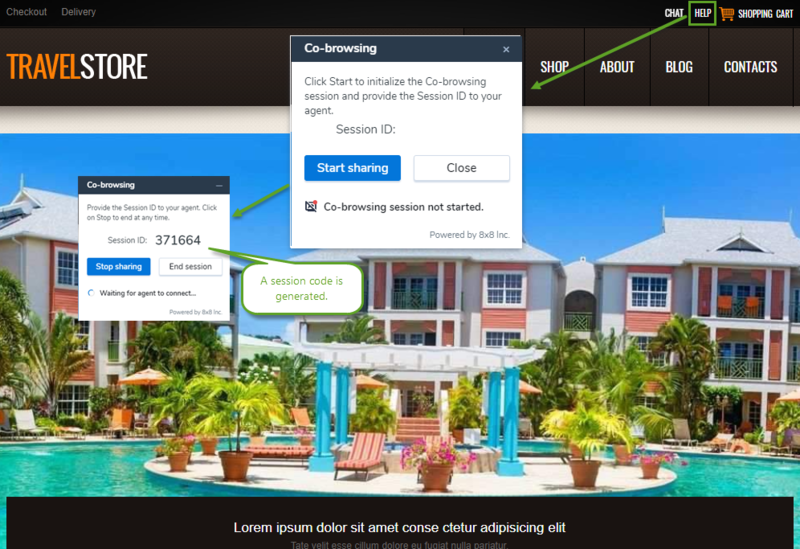 In the pop-up, click Start Sharing to generate a session code. The co-browsing window is automatically minimized as soon as the co-browsing session is established. The minimized window, however remains on the customer's screen. The customer can drag and relocate the co-browsing window. Click on the top-right corner to maximize or minimize the window. Communicate this code to the agent via the call or chat you initiated earlier. To establish the Co-browsing session, the agent must go to Menu > Co-browsing in Agent Console to open the Co-browsing window, and enter the code given by the customer. Now the agent can guide the customer with navigation on the website, or offer hands-on assistance. 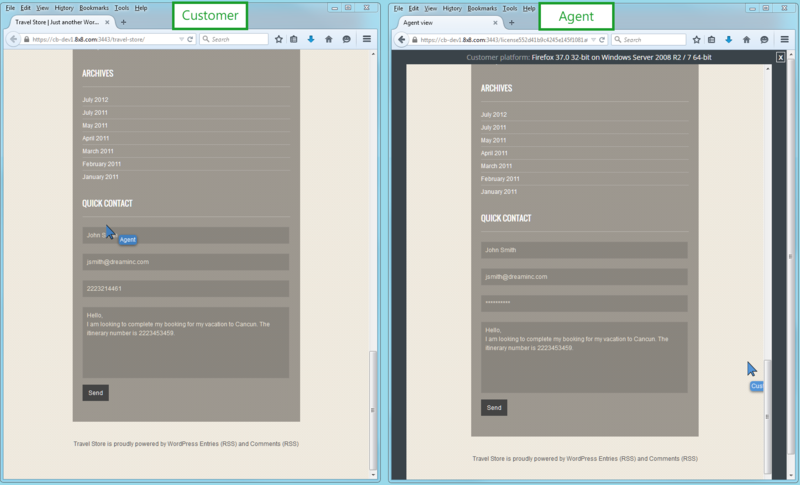 Agent can enable Auto-fit to automatically scale their view to fit the customer's browser view settings. The Co-browsing mode is also displayed to the agent. During the session, agents can highlight content on web pages using on the header bar, and call out information to customers. If content masking has been enabled in Co-browsing by the administrator, you can co-fill any required form on the website while keeping sensitive information secure. To stop the Co-browsing session as the customer, click the help link you used to start the Co-browsing session again, and click Stop Sharing in the pop-up window that appears. Once the session has stopped, the pop-up shows the session status as disconnected. On the agent's side, the agents see the page loading each time they open another page on the customer's website. Agents can close the session by clicking the Close Session button on the top-right corner of the header bar. Using the Co-browsing option in an embedded chat window, either an agent or a customer can initiate a Co-browsing session. Once the administrator enables Co-browsing via chat, agents can invite customers for Co-browsing from a chat session in Agent Console. 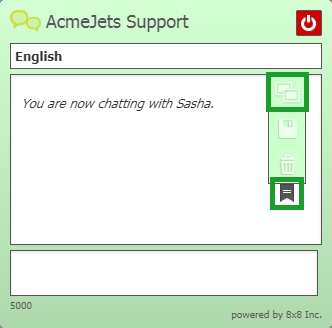 While logged in to Agent Console, accept the incoming chat interaction from a customer. Open the chat interaction drop-down menu, and select Invite for Co-browsing. The customer sees a prompt to accept the invitation, and selects Yes, start sharing. Once the customer accepts, you see a notification. Click Join to join the new Co-browsing session. To end the session, open the chat interaction drop-down menu again, and select Stop Co-browsing. As a customer, you can request a Co-browsing session via chat while chatting with an agent. Start a chat session with an agent. In the chat window, click the Ribbon icon to open a menu. From the menu, click the Co-browse icon to invite the agent to a Co-browsing session. To end the session, click the Co-browse icon in the chat window menu again. Note: Check out our video on Co-browsing in Virtual Contact Center. Set up the custom CSS by customizing the visual layout and style of the Co-browsing pop-up windows, or by customizing the customer-side Co-browsing strings. The pop-up that is shown to the customer. The pop-up that is shown to the agent. <Co-browse-server-domain-and-port> is the domain and port for the Co-browse server. <Co-browse-license-id> is the Co-browse license ID. <path-to-custom-css> is the path to the CSS file that will be loaded. To customize the CSS file for the pop-up with items like background color, apply the following styles as needed, and ensure that the styles to apply start with body.popup. To customize items specific to the agent pop-up, apply the following styles as needed, and ensure that the styles to apply start with body.replica. Note: The CSS file should be served by HTTPS, and should be accessible externally. popup-start-information: Click Start to initialize the Co-browsing session and provide the Session ID to your agent. popup-sync-information: You may have open another page that is currently being synchronized. Click Synchronize to synchronize this page instead. popup-replica-disconnected-information: Provide the Session ID to your agent. Click on Stop to end at any time. popup-connection-error-information: Click Stop to end this session or wait until connection is restored. popup-powered-by-8x8: Powered by 8x8 Inc.
status-not-started: Co-browsing session not started. status-ended: Agent ended co-browsing session. In order to customize any or all strings, it is required to add the following code snippet just above the Co-browse code snippet. Note that you can only redefine the strings you want to change, and there is no need to add strings that will remain the same. Note: You must add this code snippet to all your pages where you have the Co-browse code snippet and that you want to customize their strings.